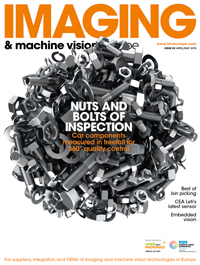 An industrial embedded vision interface and the merits of merging the CoaXPress and Camera Link HS standards will both be discussed during the upcoming International Vision Standards Meeting (IVSM), to be held in Frankfurt, Germany from 14 to 18 May. Around 150 technical experts will meet at the VDMA in Frankfurt, Germany, to work on standards for machine vision and discuss new standardisation initiatives. Silicon Software will host the meeting in cooperation with VDMA Machine Vision. The EMVA is leading an industrial embedded vision standardisation proposal to define standard communication between a processor, FPGA or other embedded processing device and an image sensor. Embedded processing boards from the consumer device space are now becoming a viable solution for developing vision systems, both for inside and outside the factory. Electrical access to image sensors is not standardised, neither for image data nor for sensor parameters, and useful signals like trigger are usually provided on separate pins. The proposed embedded vision standard will make use of existing interfaces like MIPI or SLVS-EC, and will add the necessary additional requirements to provide a fully standardised interface to ease integration of image sensor modules onto processing boards. Meanwhile, the CLHS/CXP roadmap committee (CCRC), a working group initiated by the G3 Future Standards Forum, has been looking into the synergies and possible merger of the G3 standards CoaXPress and Camera Link HS with regard to optical data transmission. The committee will introduce ideas at the meeting and propose steps for the future at the Future Standards Forum. Both CoaXPress and Camera Link HS provide high-speed data transfer; CoaXPress offers speeds of 6.25Gb/s per coaxial cable, plus camera control and power, while Camera Link HS can scale in bandwidth with either copper or fibre optic cables, supporting 2.1GB/s per cable. CoaXPress won the Vision Award in 2009, with the first edition of the standard approved in 2011. Camera Link HS wasn’t far behind with a draft version released in 2011 and the first version approved in 2012. Also on the agenda for discussion at IVSM will be a proposal for standardising the electrical and communication interface between a machine vision lens and a camera. The standard would allow users to retrieve and control lens parameters through a camera using the GenICam software layer. GenICam, GigE Vision, CoaXPress, Camera Link, Camera Link HS, USB3 Vision, and VDI/VDE/VDMA 2632 will all have dedicated working group meetings at the event. In addition, the OPC Vision initiative – the newest G3 standardisation project led by VDMA Machine Vision – will meet and introduce its work to the G3. The goal is the elaboration of an OPC UA companion specification for vision describing an easy integration of machine vision in an Industry 4.0 context. The core working group will introduce and discuss a first draft of the companion specification. The 16 May will be dedicated to a plug fest, where cameras, different hardware devices and software are tested for interoperability with the standards.